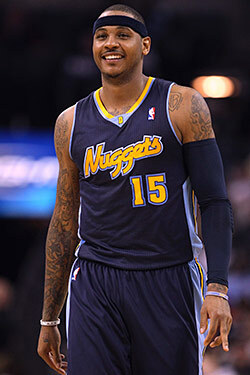 Carmelo Anthony is, as of this morning, still a member of the Denver Nuggets, and even he's not sure whether that will be changing soon. You'll recall that yesterday, the Nets, Nuggets, and Pistons were on the "brink" of a blockbuster three-team trade that would have sent Anthony to New Jersey, assuming he'd be willing to sign a contract extension. Now, the Nuggets are reportedly making new demands, and, according to one report, threatening to trade Anthony to the Knicks if talks with the Nets don't stay private. "That's my feeling. I don't think so. I don't want to elaborate on that anymore. That's just my own personal feeling," Anthony said following practice. Asked if he would sign his three-year, $65 million extension to facilitate a trade to the Nets, Anthony said: "I really don't know." The Nuggets, though, may have an ulterior motive for that demand. Said ESPN.com's source: "The teams haven't stopped talking, but the Nuggets are trying to show people that they aren't going to be rushed into anything."